I’ve just completed a review of Gideon Botsch’s history of Right-Wing Extremism in Germany after 1945 for Jahrbuch Extremismus & Demokratie. The book is good, but obviously, I have few quibbles, mostly with the (lack of) theoretical underpinnings. I also think that it is a bit too short (I seem never to get enough of this stuff). If you read German, go to the full review. Courtesy of Google’s book search, a large parts of my new book on the Extreme Right in Western Europe (in German) is now available online. I don’t know how they calculate which and how many pages one may view but I was able to read several consecutive pages of it. Plus you have the search function which comes in handy if you know exactly what you are looking for e.g. because you want to verify a quote. 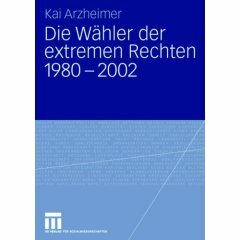 And if Google fails you, you can always try amazon which has its own online version of “Die Wähler der Extremen Rechten 1980-2002”. Nice.